Ask nearly any American in the corporate sector, and they’ll tell you they feel as though they’re working longer days at jobs that are becoming increasingly difficult. As a result, it’s really no surprise that more and more workers are beginning to feel the impact of workplace stress. In fact, according to the American Institute of Stress, stress and conditions aggravated by stress costs the American economy over $300 billion dollars annually. Luckily, NeuroSky has developed a wearable, mobile ECG device to help combat the influence of workplace stress—The LifeBeat personal health and activity tracker. The Dangers of Workplace StressBeyond problems such as absenteeism, diminished productivity, and workplace accidents, stress is taking both physical and emotional tolls on workers. A recent survey found that 14% of respondents claimed that they felt the urge to strike a co-worker within the past year. An additional 18% of those surveyed indicated that they had been threatened both physically and verbally in the workplace. Corporate wellness programs are in place to make a difference in both the physical and emotional health of employees. These programs are designed to help support employees through healthy behaviours in and outside of the workplace. LifeBeat is a personal health and activity tracker that gives users the ability to accurately identify stressors, measure their stress levels, and help them lower overall stress in their personal and professional lives. It does this with help from NeuroSky’s proprietary, market-leading BMD101 ECG biosensor. 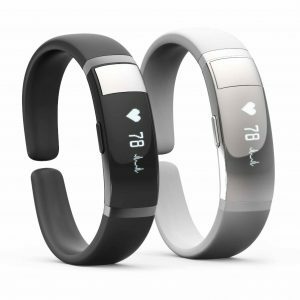 This sensor tracks a user’s heart rate variability (HRV), and through the use of complex algorithms, translates that data into relatable, understandable information regarding the physical and emotional state of the wearer. All data collected by a LifeBeat can be synced with cloud-based data aggregators for analysis and tracking. This makes it a valuable tool for any corporate wellness program that hopes to unify their employees toward goals of better overall mental and physical health. Workplace stress is impacting employees across the country—this is a clear fact. LifeBeat is a powerful tool that can help your organization better manage the stress levels of employees, as well as their overall mental and physical health. In doing so, your organization will help staff stay happier, healthier, and more productive. 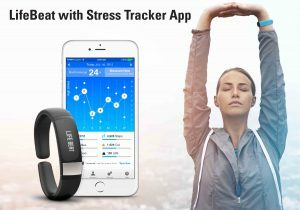 To learn more about NeuroSky’s LifeBeat personal health activity tracker and how it can help your employees combat stress, contact us today. Discover how our advanced ECG biosensors can enable easy-to-use mHealth wearables, devices, and apps to help users track and better manage stress. 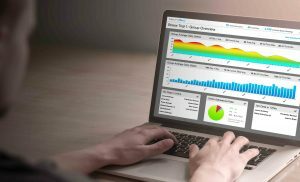 Download the Whitepaper: Enabling Accurate and Reliable Stress-level Measurements with NeuroSky ECG Technologies now.